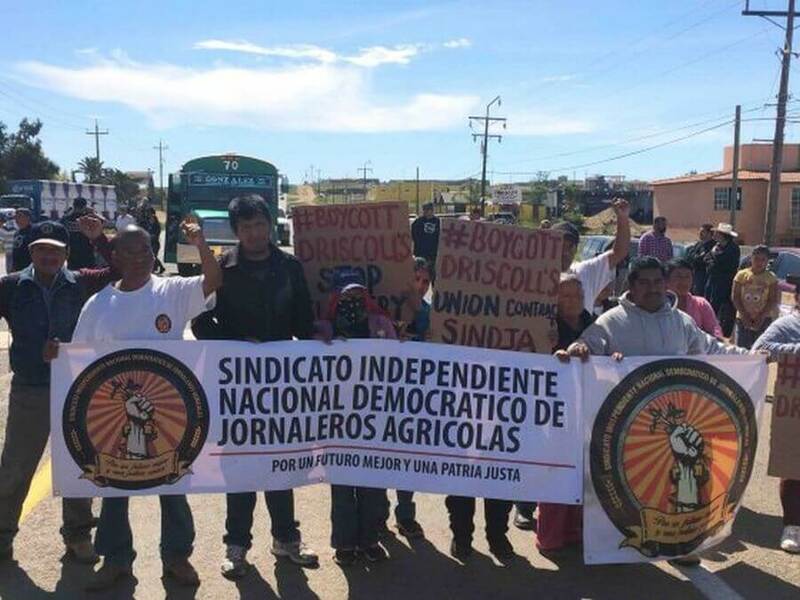 Solidarity with the farmworkers in San Quintín, Baja California leading the international movement to Boycott Driscoll’s. Last March 4th, the Caravan for a Fair Wage and Decent Life began with a blockade of the Transpeninsular Highway by the day laborers from the fields of the San Quintin Valley. The workers then went on to cover 3,000 kilometers, arriving in Mexico City on March 17th. Two years ago, the strike of thousands of farm workers brought to light the appalling conditions in which at least 80,000 men, women and children toil as day laborers in Baja California agribusiness. The hours are long, up to 14 hours a day with no rest on the weekends at a deplorable wage, with no vacations, no social security and no decent housing with basic services. Striking workers denounced human rights violations, and especially sexual abuse and harassment of the mainly indigenous women workers by the foremen. In response to a call sent out by the National Democratic Independent Farm Workers Union (SINDJA) and the Alliance of National, State and Municipal Organizations for Social Justice, this year’s Caravan was organized to protest non-compliance of agreements reached with federal and state government officials in Baja California. The struggle continues for decent wages and benefits, the right to social security and an end to the sexual harassment of women. 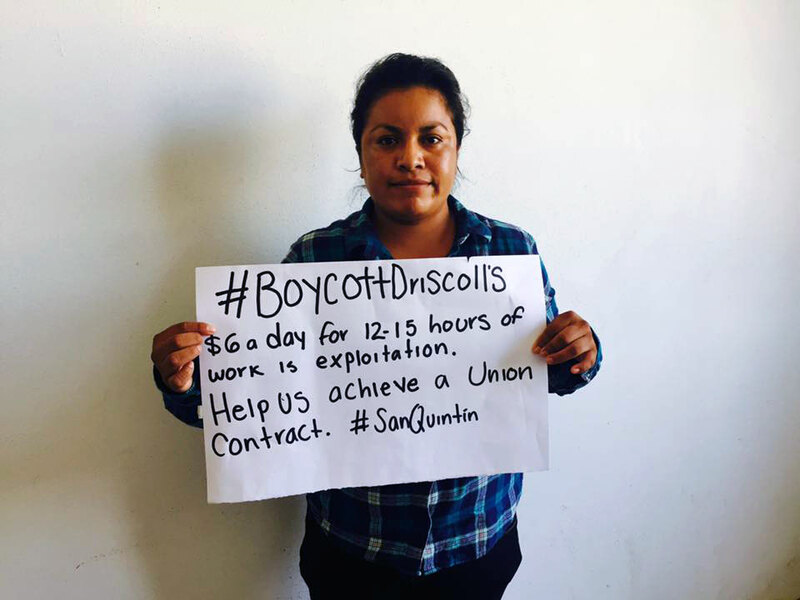 October 15 support the 80,000 farmworkers in San Quintín with the message that the boycott of Driscoll’s Berries continues until there is a union contract. 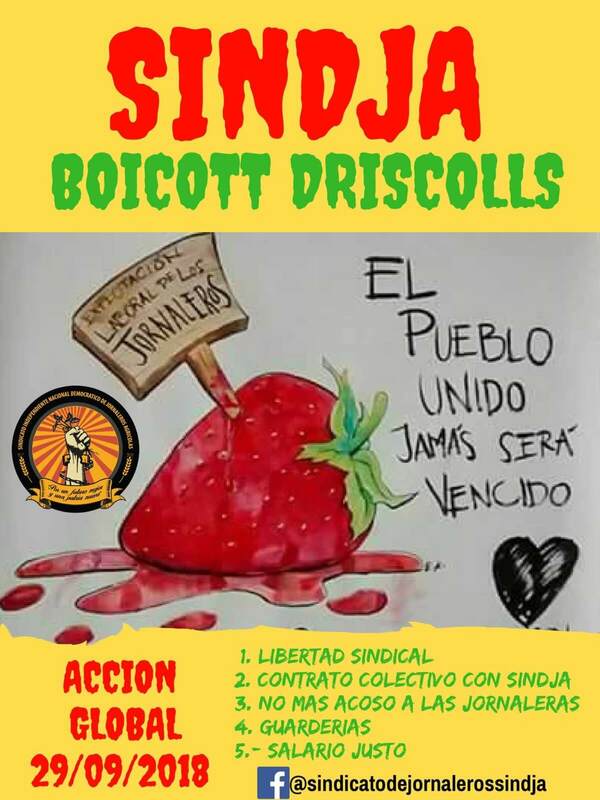 On October 15 there is a call for an International Day of Action to support the 80,000 farmworkers and their families in San Quintín Valley, Mexico with the message that the boycott of Driscoll’s Berries continues full force until there is a union contract. Currently, farmworkers toil 12 to 15 hours a day in the fields for as little as $6/day. Many are not provided social security, health insurance or any type of job security. For more information on the working conditions in San Quintín and the farmworkers struggle, see The San Quintín Rebellion. We will continue our resistance, boycotting Driscoll’s for a better life and a better future for farmworkers’ families in San Quintín. After more than a year of struggle that began in the San Quintín Valley of Baja California when more than 80,000 farmworkers rose up in protest in order to improve their working and living conditions, we remain in resistance. In front of government bodies we have reported on the inhumane conditions that farm working families live with daily, our voices have been heard in the Mexican Congress, in the the United Nations, and even in Geneva. Two years earlier, a slogan had spread like a dust cloud: fair wages. There was already talk of a “crazy idea”: they had to rise up. We’re excited to share news about the launch of a new bilingual microsite on the San Quintín rebellion in Mexico, published by Regeneración Radio. Below are excerpts from the site.